I have been meaning to make these ever since they appeared in Coconut and Lime’s blog some time ago. But every time I bought vast quantities of blueberries because they were in season and on sale, they’d be eaten before I got around to buying the goat cheese. Or I’d buy the goat cheese, but not get around to buying blueberries in time, so I’d have to eat the goat cheese before it went bad. This time I bought blueberries, and before they all disappeared in my cereal bowl, in fruit salad, or mixed in sour cream, I made a determined effort to buy the goat cheese. Then I had to think of a way to lower the fat a bit so I could eat them with reasonable abandon. 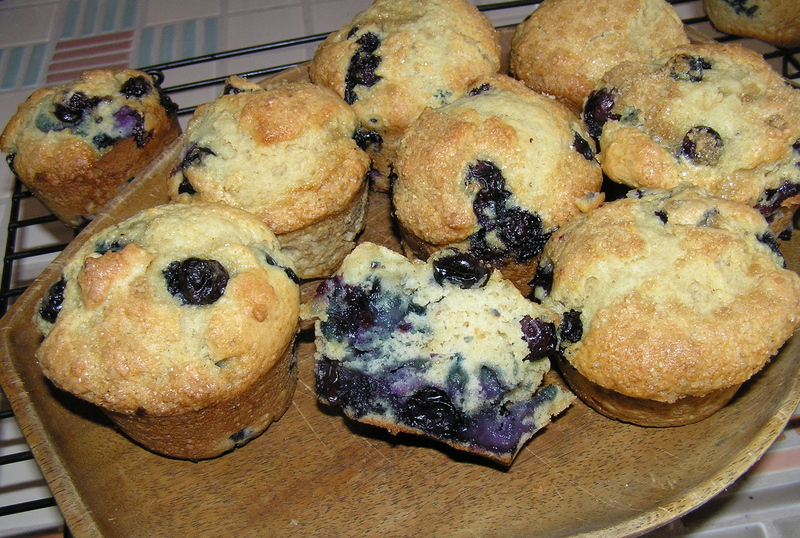 These muffins have two of my favorite foods – blueberries and goat cheese. How could they possibly be bad! And, in fact, they were great. But quite unexpectedly, they did not have a goat cheese flavor – which was just fine, since they were the lightest, most tender muffins I have ever made. I took some of them to a meeting, still warm, and when I passed them around there were moans of ecstasy as my fellow attendees bit into the muffins. The original recipe also called for 1/2 cup blueberry puree. I thought that this would make the muffins rather purple, which was not an effect I wanted, so I substituted the applesauce. Preheat oven to 400. Grease or line 12 wells in a muffin tin. In a large bowl, whisk together flour, sugar, baking powder, baking soda and salt. Set aside. In another large bowl, mix together butter, applesauce, goat cheese, egg and vanilla until blended. Add the dry ingredients. Mix the batter thoroughly (batter will be thick) then fold in blueberries. Fill each well about 3/4 of the way and sprinkle with demerara sugar if using. (I used turbinado sugar, which gave the tops a nice little bit of crunch.) Bake 15-20 minutes or until toothpick comes out clean or with just a few dry crumbs. Remove to rack and let cool at least 10 minutes before serving. Makes 12 wonderful muffins at just under 4 grams/ muffin. In the interest of cleaning out the freezer in preparation for a great defrosting effort, I have been eating stored food. I have eaten buffalo pot roast, Moroccan vegetable stew, barley-stuffed cabbage rolls, pork and plantain stew…and did I mention buffalo pot roast? Sometimes I add more vegetables when I defrost the goodies – but I haven’t been making many new dishes. Whilst pawing through the freezer door to see if there was viable food there (any sentence that begins with whilst means that one has procrastinated altogether too long in carrying out the task), I came upon yet another bag of frozen cranberries. 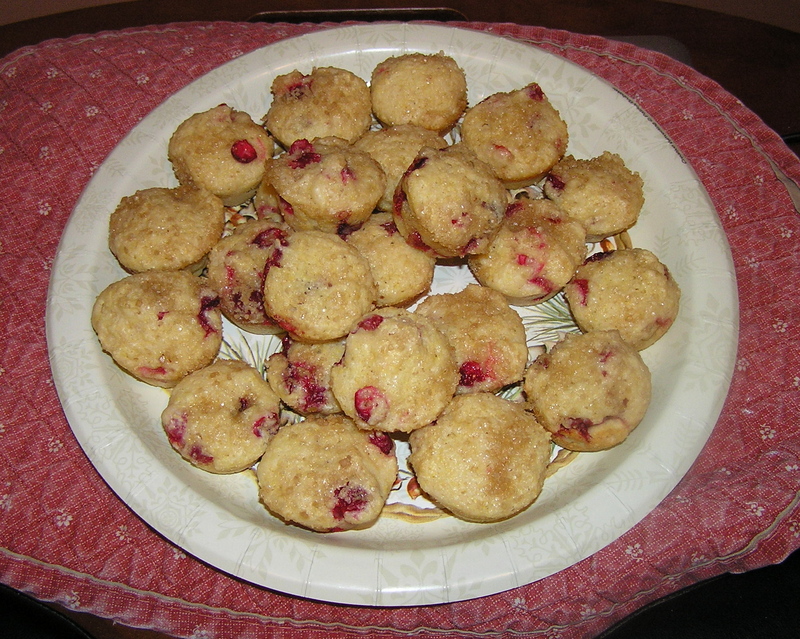 I have been craving cornbread for some reason, and I combined my craving with the cranberries and came up with these muffins, which are a combination of several recipes. Preheat oven to 350. Coat muffin cups with cooking spray. Whisk together egg substitute, melted butter, applesauce, buttermilk, lemon zest and lemon juice in a large bowl. In another bowl, stir together cornmeal, flour, sugar, baking soda and salt. Add to egg mixture, stirring only until blended. Fold in cranberries. Fill the prepared muffin cups 2/3 full and sprinkle tops with sugar. Bake 15-20 minutes, depending on the size of muffin, or until muffins are golden and a wood pick inserted in them comes out dry. This makes 24 large muffins, or about 40-48 mini-muffins. Large muffins have about 3 grams of fat each, mini-muffins have about 1.5 grams of fat each. I made mini muffins because they were cute. have been really hungry lately. Maybe it’s the cold, grey weather that’s been hanging around for a few days, occasionally dropping what the weather folks call a “wintery mix”. Or maybe it’s because I am working over the holidays, albeit from home. Work from home wearing sweats, while an improvement over getting dressed up to go to the office, is still work. At any rate, I decided I need to get back into my habit of baking a dozen muffins every week to stave off the times when I feel the need to eat something satisfyingly sweet and filling. Baking also warms up the chilly kitchen. The scent of aging bananas was perfuming the kitchen, so I decided to make a variation on my standard banana bread in muffin format. 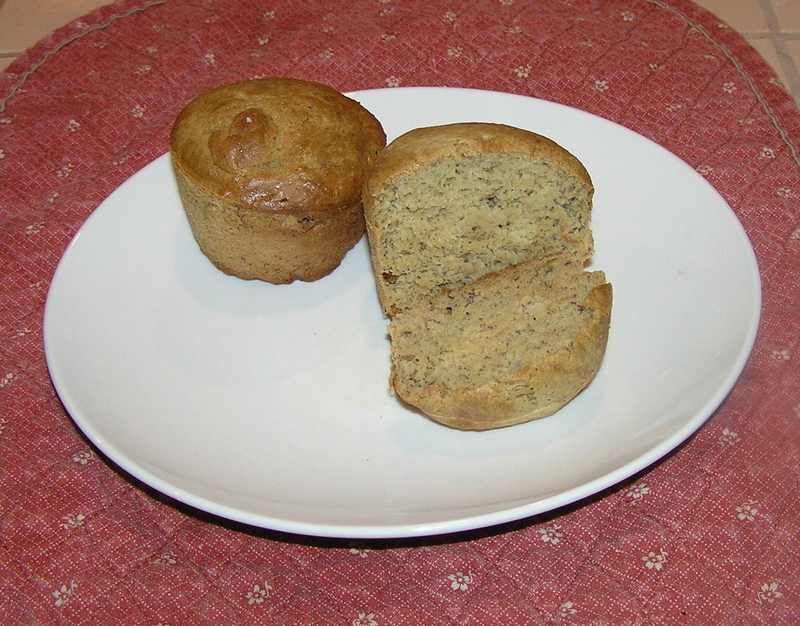 By the way, when you use bananas for bread or muffins, they should be very ripe – mine were actually black, The riper the banana, the sweeter they make the batter. Preheat oven to 350 F and place rack in center of oven. Spray 12 muffin cups with cooking spray. Whisk the flour, ginger, nutmeg, cardamom, salt, and baking soda together in a medium bowl. Put the bananas into the large bowl of an electric mixer and beat them until they are well mashed. Beat in the egg substitute. Beat in the sugar. Add the flour mixture about 1/4 cup at a time, until it is incorporated into the banana mixture. Beat in the yogurt. Stir in the raisins if using. Pour the batter into the prepared muffin tin and bake for 25-30 minutes, or until a wooden pick inserted into the center of a muffin comes out clean. Remove from oven and let cool 10 minutes. Remove muffins from the pan and cool on a rack. Eat warm – like I just did – or cold. Makes 12 muffins. There is less than a gram of fat per muffin. It’s definitely time to bake muffins, if only to warm up the kitchen. I always leave the oven door open after I bake to use the leftover heat – after all, I already paid for it. I have cranberries in the freezer left from last holiday season. I need to use them up, even though I’m probably just going to put more bags in the freezer from this year’s crop. You only seem to find them in the store during the holiday season. This recipe is originally from Coconut and Lime, I just lightened them up a bit so I can eat them for lunch or as an evening snack. They were prettier than expected, with the red cranberries poking through the dough. I opted to bake them in paper liners, because I thought the cranberries might stick to the pan. I have to say that my first bite of the muffin was a little disappointing, a trifle bitter. But then I ate a bit more and it was really a pleasantly unexpected combination of flavors, with the ginger giving the muffin a little bite in contrast to the tart cranberries. Preheat oven to 350. Line or grease and flour a 12 well muffin pan. In a large bowl, thoroughly mix together the oatmeal, egg substitute, oil, applesauce, buttermilk, and sugar. Spoon flour into measuring cups. Add the flour, salt and baking soda to the liquid mix. Stir until thoroughly moistened. Fold in the cranberries and ginger chunks. If you are using frozen cranberries, make sure that frozen clumps of berries are broken up in the batter. Divide the batter evenly among 12 muffin cups. Bake 15-20 minutes or until a toothpick inserted in the center of a center muffin comes out clean. Cool on wire rack. Makes 12 servings at about 2 grams of fat/serving. The blueberries are finally gone. And when I went to Safeway to get the 2 pound bargain box of blueberries, they were sold out. I have been saved from myself. Of course, I got a rain check, but seasonal items usually don’t come in again, so this probably is the end of compulsive blueberry cooking. It’s a good thing. My plum tree has gone wild, and I will soon have to compulsively cook plum things. This recipe is just my old fashioned sweet southern cornbread with blueberries added. I’m a big cornbread fan. There’s hardly any meal that doesn’t go well with warm homemade cornbread. It’s easy to make, too. And if you must butter it (it’s moist enough to go it alone), use light butter and your fat grams will be reasonable. Preheat the oven to 425. Spray an 8 inch square cake pan with cooking spray. Whisk together the cornmeal, flour, sugar, baking powder, and salt. Add the egg substitute, milk, and melted butter, stirring until just blended. Fold in the blueberries. Spoon into the prepared pan and bake for 20 minutes, or until a toothpick inserted comes out dry (the blueberries may still be wet, but the batter should be dry.) Cool. Makes 12 servings at about 2 grams of fat/serving. Variation 1: This also makes great muffins. Spray 12 muffin cups with cooking spray. Divide batter evenly among them. Bake for about 15 minutes, or until a toothpick inserted comes out dry. Variation 2: If you leave the blueberries out, you just have old-fashioned sweet southern cornbread, which is right tasty in and of itself. I just got back from a week’s trip to the Washington DC area. It was unseasonably cold and snowy. It has been my experience that snow and cold other than at Christmas, are always described as “unseasonable”. I did not have winter clothes with me, as when I left Spokane the weather in DC was supposed to be in the 50’s – which it was for a day. So I went from one appointment to the next, freezing. When I flew home, I got in at midnight, and my car, which was parked at the airport, had a dead battery. Yes, it was my fault – a light got left on. And did I mention that it was freezing in Spokane and I still didn’t have a winter coat on? When I woke up the next morning it was snowing heavily – unseasonable no doubt. And it dropped to 7 degrees. But at least I was re-united with my parka. So I am in the need for some serious comfort food. I was really glad to have all that soup and pot roast in the freezer to eat until I could get to the grocery. These muffins are true comfort food. They are muffins, which, as I have said before, are a comfort food by their very name. And chocolate! What else says comfort like chocolate, especially when combined with that other comfort food, banana. This was a recipe for bread, and the muffins are somewhat bread-like rather than very sweet. The original recipe (which I’m not sure where originated) had banana chips in it, which are rather high in fat – 15 grams for a half cup. I also thought the idea of banana chips in muffins was really unappealing. The original bread was quite high in fat, although there was no added oil since the prunes and banana took the place of fat. The bread was almost 8 grams of fat for a 1/20 of the loaf slice. So who is going to accurately measure 1/20 of a loaf – and how will that be enough to snack on? So we have muffins, the pre-measured snack delight. I also reduced the fat by halving the amount of chocolate chips and walnuts. Preheat oven to 350. Spray 12 muffin cups with cooking spray. In a food processor, process prunes and banana until very smooth. Add egg substitute and process until combined. In a large bowl, whisk together flour, cocoa, baking powder, baking soda, and cinnamon. Stir in the banana mixture until evenly moistened, being sure to scrape the bottom and sides of the bowl to incorporate all of the dry ingredients. Stir in the walnuts and chocolate chips. Spoon batter evenly into prepared muffin cups. Bake for 20-25 minutes, or until a wooden pick inserted in the center of a muffin comes out dry. This makes 12 large tasty muffins at about 4 grams of fat/muffin. Variation: You can also use ½ cup whole wheat pastry flour and ½ cup all purpose flour, or entirely (1 cup) of all purpose flour. Comment: I was so anxious for my comfort food that I bought the ripest bananas I could find at the grocery and used them –they were still mostly yellow. The muffins would be sweeter if you used really ripe, soft bananas. But I couldn’t wait for ripening. I want my muffins NOW! The snow is finally melting! I can see parts of my truck and driveway. For three mornings in a row, I did not have to shovel snow!! What will I do with all the free time. Obviously, I’ll cook. I bake muffins about once a week. They go in my lunch bag and make a great late night snack. I occasionally (today) eat a muffin and fruit for breakfast. These muffins are a little different because they are made with fresh ginger, which gives them a little bite. They are not dark brown, like most gingery baked goods. I did not have to alter the original recipe from Cooking Light, because they were already quite low fat. Preheat oven to 375. Spray 12 muffin cups with cooking spray. Combine 1 tablespoon of the sugar, ground ginger, and cinnamon in a small bowl. Set aside. Combine remaining sugar, flour, baking soda, and salt in a large bowl. Make an indentation in the center of the flour mixture. Combine the ginger mixture, buttermilk, applesauce, oil, egg and egg white; stir well with a whisk. Add to the flour mixture, stirring until just moist. Divide batter evenly among prepared muffin cups. Sprinkle ¼ teaspoon cinnamon mixture over each muffin. Bake at 375 for 20 minutes or until golden. Remove from pans immediately and cool on a wire rack. Makes 12 muffins at about 2 grams of fat/muffin. Note: The originally recipe called for prune butter as the fat replacement, but this product has essentially disappeared from local groceries. I think applesauce made a good replacement, but if you have prune butter you could use it. Variation: I didn’t have blueberries in the house, but I think that these would be very good with a cup of blueberries in the batter.